One of the sacred tenets of good corporate governance is separating the roles of Chairman of the Board and Chief Executive Officer. This provides a critical oversight function with respect to the activities of the CEO. Exhibit one supporting this concept is perhaps JP Morgan CEO Jamie Dimon’s role in the current multi billion dollar scandal regarding trading losses in its risk management unit. 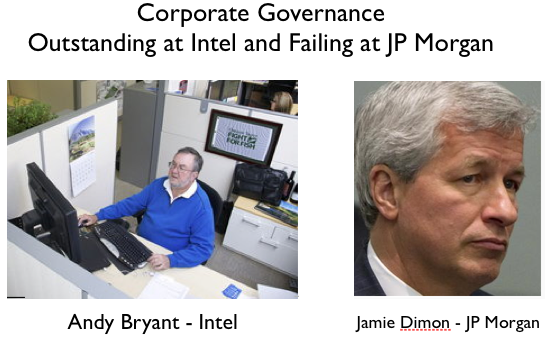 Meanwhile over at Intel the current Chairman of the Board is former Chief Financial Officer Andy Bryant. The CEO is Paul Otellini. Otellini can run the business as he wishes yet he is accountable to the board and specifically Bryant. At JP Morgan, Jamie Dimon, in a spectacle of abject arrogance, assumes both roles and is accountable to no one. Even more remarkable is that JP Morgan, as one of the nation’s largest FDIC insured institutions, is putting taxpayers at risk by this breach of good governance. It is noteworthy that JP Morgan could well have gone under in the recent crisis if the FDIC had not allowed it to assume Washington Mutual’s large deposit base while only assuming minimal liability with respect to its loan portfolio. Further degrading good corporate governance principles is Dimon’s role as a board member on the Federal Reserve Bank of New York, one of the banking industry’s primary regulators. Clearly, Dimon should resign immediately and spend more time with his lawyers given the increasing scrutiny from the SEC, FBI and other regulatory agencies regarding the massive trading losses under his watch at JP Morgan. Parish & Company has been a leading advocate of sound corporate governance for more than 15 years.